Statistics about how much people use their smartphones seem to constantly contradict one another. In her Internet Trends 2013 slide presentation, Mary Meeker tells us that we check our phones 150 times a day, between apps, voice calls, texts, and utilities. That seems like a lot. If each interaction lasted an average of one minute, that would mean we are on our phones for over two hours a day. But are we? We’ll return to the 150 times a day chestnut lower in this article. Flurry, an app analytics firm, said that in December 2012 U.S. smartphone and tablet owners spent two hours a day just on apps, 127 minutes a day to be exact. That’s certainly an eye-catching number. U.S. government data says the average American watches roughly 168 minutes of TV daily, so for those who own smartphones or tablets, time-spend on apps is within spitting distance of the king of media: TV. So far so good. But more recently, Experian Marketing Services came up with a much lower number for how much time U.S. consumers spend on their smartphones: 58 minutes. How can this be? 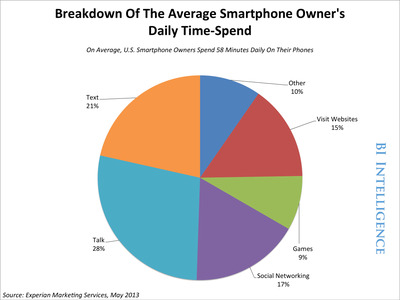 Which is it: do U.S. consumers spend an hour a day on their smartphones, or two hours? To begin with, Flurry includes tablet app usage, and Experian only tracks smartphones. But more broadly the answer depends on what you’re measuring, and how. Flurry’s data comes from the hundreds of thousands of apps globally that have the company’s analytics technology installed. Flurry has one of the most massive collections of data on app usage in the world. Every time a user starts a session on an app that has Flurry’s analytics technology installed, that activity is recorded. Experian Marketing Services uses a consumer panel. This is a large sample of people, presumably a cross-section of U.S. consumers, who have been recruited to install an activity meter on their smartphones. Based on their activity, Experian calculates an average amount of time the panelists spend on various mobile tasks — including texting, calling, and gaming — and then produces an average. As Experian itself notes, many smartphone owners in their panel never complete any of the tracked activities, including video-watching, gaming, or social networking (only 52% of the panel engaged in social networking on their smartphone on a typical day). Some of Experian’s subjects probably don’t even have a gaming app or Facebook installed on their phone. Flurry, since it is an app analytics company, is measuring the activity of app users. If a smartphone owner doesn’t use apps or have any Flurry-client apps installed on their smartphone or tablet, they won’t show up on Flurry’s radar. Returning to Mary Meeker’s oft-cited point on users checking their phone 150 times a day: Let’s discuss the source for that number. The source, as noted on her presentation, is Tomi Ahonen, a well-known mobile analyst. As Ahonen himself has written, his 150-times-daily statistic originated in 2010 with Nokia, which used it to trumpet the rise of mobile. Ahonen has himself written persuasively about why the 150 times a day number is reliable, but his validation of it is qualitative: He relies on an assortment of statistics, personal observations, and as he puts it, “chats with some fellow experts.” So, does an average smartphone user check their phones 150 times a day? Maybe. But it’s definitely not data-backed market research. Experian’s typical U.S. smartphone owner spends 58 minutes a day on their smartphone, including making and taking calls, texting, using social media, and gaming. Flurry’s U.S. tablet and smartphone app users spend two hours a day on average in their apps, with 43% of that time in gaming apps, compared to 9% among Experian’s smartphone owners. (See chart, above.) Flurry’s numbers are direct observations of actual usage and are unimpeachable, but we should remember that power users tend to skew mobile statistics a bit because they drive such a disproportionate share of activity. Not all smartphone owners spend a lot of time in their apps, and many may not play games at all. Mary Meeker and Tomi Ahonen’s compulsive phone-checker sounds possible, but many of those interactions with the phone may last a second or two — a glance at the time on the lock screen, for example. Or these rapid-fire interactions may be coupled with other tasks: a glance at the time, and then a click to the “recent calls” list, etc. It’s not a meaningful metric for smartphone usage. My bottom-line: The average U.S. smartphone owner probably does spend about an hour of meaningful time on their device, while average U.S. app usage is two hours or more daily. The median app user will likely spend less time. Mobile usage is growing, but mobile’s not going to dethrone the TV — yet.